01/16/2019 - Ryan Sproul was the overtime hero, and the Hershey Bears won a 1-0 overtime thriller over the Binghamton Devils on Wednesday night at the Floyd L. Maines Veterans Memorial Arena. Ilya Samsonov stopped all 16 shots to record back-to-back shutouts. For the first time this season, the Bears and their opponent went 60 scoreless minutes in regulation. Hershey went 0-for-6 on the power play, including 0-for-4 in the first period, and 3-for-3 on the penalty kill. Into the 3-on-3 overtime period, Sproul fielded a clean, head-man pass from Mike Sgarbossa, and bolted into the offensive zone on a breakaway. A top-shelf shot beat Devils goaltender Cam Johnson at 3:20 of the overtime period. The 16 shots allowed by the Bears is a new season low, beating the previous mark of 18. Samsonov is the first Hershey goaltender to record back-to-back shutouts since Pheonix Copley on October 19 and 26, 2014. Copley's first of the two shutouts also came in a 1-0 overtime final. Hershey now rides a three-game winning streak, which ties a season high. The victory snapped Binghamton's four-game winning streak. 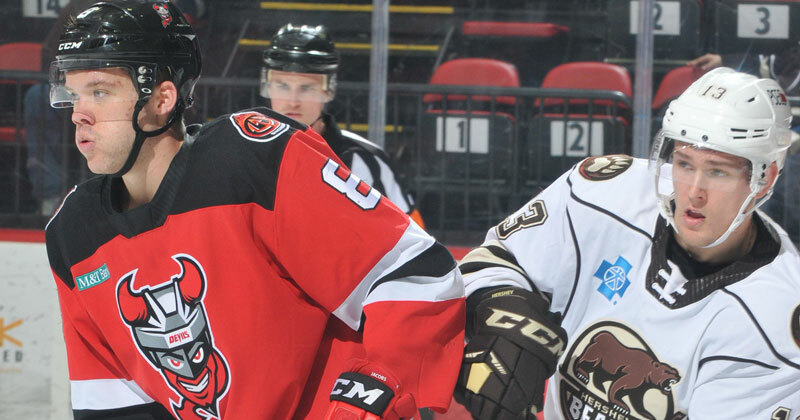 The Hershey Bears return to action on Saturday for a 3:05 p.m. road tilt against the Wilkes-Barre/Scranton Penguins. Voice of the Bears Zack Fisch will have the call on the Bears Radio Network.